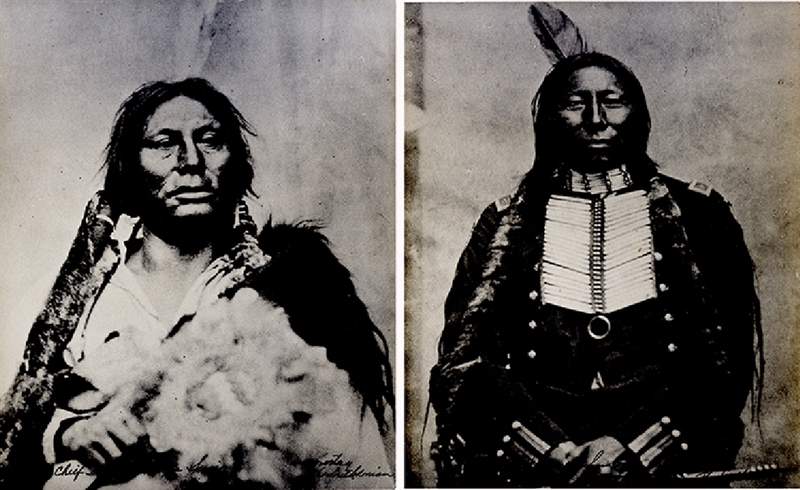 A Pair of 8” x 10” Black/White photographs with printed identification in the negative, “Courtesy the Smithsonian”. the first is “Crow King, Hunkpapa Siouix” with back wet stamp “Distributed by Coffrim’s old West Gallery, Miles City, Montaba”. Crow King, Hunkpapa Sioux, who at the Little Bighorn was the first to reach Medicine Tail Coulee from the south with eighty men, becoming the first to pursue Custer’s five companies up the long slope. At the end of the Indian wars, he was one of the last to give up. .. plus, “Chief Gall, Hunkpapa Sioux”, war chief, who was one of the most important military leaders at the Battle of the Little Bighorn (June 25, 1876). He eventually abandoned Sitting Bull and surrendered to the U.S. Army (c. 1880). Both VG, nd.